This is a guest post by QuickBooks Advanced Certified ProAdvisor, Victoria Cameron. Are you starting a new business and wondering which Intuit accounting package to choose? 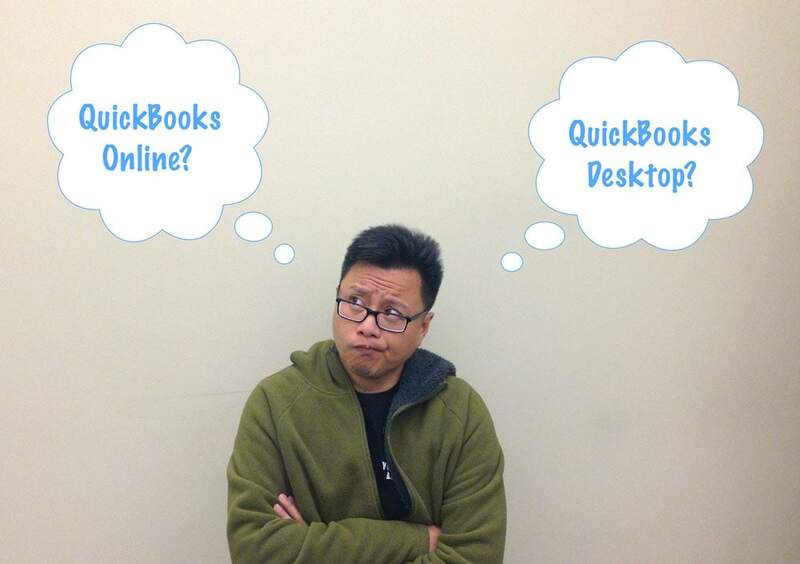 Or, as a QuickBooks Desktop user, are you wondering if you should switch your business over to QuickBooks Online? At Cloud Consultancy, we love QuickBooks Online and encourage our clients to go with this platform, but sometimes QuickBooks Premier or Enterprise is the better option for certain businesses. However, the beauty of QuickBooks Online is the Ecosystem Intuit has created around it. So, issues that often force a company to choose QuickBooks Desktop can be solved by subscribing to Intuit partnered apps, like Method:CRM – a customizable Customer Relationship Management solution for QuickBooks users. 1. How many people need to access QuickBooks and where are they located? If you have a distributed team, as we do at Cloud Consultancy, QuickBooks Online offers anywhere, anytime access to up to 25 people. Additionally, you can give access to two accounting firms and have unlimited time-entry and reports users. If more than 25 people need to access core accounting functions, QuickBooks Enterprise is a better choice. However, if you sync Method:CRM with your QuickBooks Online account, you can give access to unlimited users for all sales and customer service related functions. 2. Will you want to restrict access to certain users in QuickBooks? QuickBooks Enterprise has much more granular permission settings than QuickBooks Online, so if you need to restrict who can access what, desktop is the better choice. However, Method:CRM handles user restrictions even better. Method allows you to restrict not only who can access what within QuickBooks, but it also permits restrictions on what data your staff can enter, such as only having access to a particular set of items, or a particular class. 3. Do you have advanced inventory needs? QuickBooks Desktop, especially Enterprise, is often touted as the only choice for companies who need to build assemblies, use units of measure, or track Sales Orders, back-orders, or drop-shipments. But QuickBooks Online combined with apps like Method:CRM and/or Exact Online or SOS Inventory can be perfectly adequate for many businesses. 4. Do you need mobile access to QuickBooks data and forms? If you and or your employees are on the road often, this is where QuickBooks Online really shines. Their mobile app, particularly the tablet one, allows mobile staff the ability to create an estimate or invoice, get a customer signature, and accept payment – all from a simple interface on the go. 5. Do you need detailed job costing? While QuickBooks Online is a great choice for contractors who are usually out in the field, contractors who manage larger jobs want to allocate all expenses to each job, such as payroll costs and worker’s compensation. QuickBooks Online payroll options do not yet sync job details for reporting purposes, so a QuickBooks Desktop version combined with QuickBooks Full Service payroll is a better choice. 6. Do you have sales reps? In QuickBooks Online, you are not able to track sales by a particular sales rep, other than co-opting the class or location fields. However, in Method:CRM you can easily customize your account to track and report on sales by rep. Plus, you can build a portal in Method for your reps to log in and place their orders themselves – really cutting down on the work for your accounting staff! 7. Do you want to customize your forms or create detailed custom reports? QuickBooks Desktop has many more options for customizing sales forms and creating detailed reports. But again, using Method in conjunction with QuickBooks Online gives you the ability to create custom forms to look exactly the way you want. And the custom reporting capabilities of Method:CRM are even greater than the QuickBooks Desktop versions, even with the new Advanced Reporting feature of QuickBooks Enterprise. 8. Do you dislike using Windows? Using QuickBooks Online gives you the option of using Macs or Chromebooks to do your accounting, so you can stay away from the complexities of Windows updates and syncing issues. It is difficult to discuss cost at a high level like this, because cost can depend on many variables: number of users, applicable discounts, and add-ons for inventory management, importing, and reporting. There is a general perception that Intuit’s online subscription model is more expensive, particularly when compared to keeping the same desktop software for two or three years. We disagree, given the other advantages of using cloud based software. For example, the functionality of QuickBooks Online continuously improves; on average, updates are released from Intuit every two weeks. In fact, some of the feature limitations discussed here may not be relevant in a few months time. Also, keep in mind that the Enterprise version of QuickBooks Desktop recently changed to the subscription model: you’ll need to pay an annual fee or your software will stop working. For more details on this, check out Charlie Russell’s post from the Sleeter Group. When you’re making your decision between QuickBooks Online and QuickBooks Desktop, make sure you’re evaluating the latest version of QuickBooks Online and steer clear of outdated articles. While my team and I at Cloud Consultancy urge our clients to use QuickBooks Online, the decision comes down to what is best for your unique business. But, remember that adopting an Intuit partnered app like Method:CRM will remedy any QuickBooks Online limitation you may come across, and provide you additional functionality to improve how you run your business. Victoria Cameron is a partner at Cloud Consultancy, LLC, a company founded by three Advanced Certified Method Partners. Cloud Consultancy provides a range of customized business process solutions and is the publisher of the AERO Workflow Manager. Victoria is a long time QuickBooks Advanced Certified ProAdvisor, is certified in Enterprise Solutions, POS, and QuickBooks Online, and provides QuickBooks consulting as the principal of Victoria Rehrig Cameron, LLC. A Mac user since 1984, she loves that QuickBooks Online means she rarely has to use Windows anymore.